For a wine dine get together with two wine buddy friends Don K and TRR, we took some special bottles BYOB to our regular meeting place for such occasions, Angeli's Italian, our favorite neighborhood trattoria. Don came by to pick up fifty bottles of wine I had acquired for his cellar as part of my consolidated buying for myself and my wine buddies. We learned our lesson and started this practice years ago to avoid bidding against each other for the same wines at auction! Also it allows us to pool our resources for greater buying influence/power, and to spread the spoils of allocated wines. Don brought a Wallis Family Estate Napa Diamond Mtn Cab while Tom brought a classic Tignanello 1999. Both wines were perfect accompaniments to the Italian Sausage and Peppers starter and the hearty pasta dishes. crafted by legendary winemaker Thomas Rivers Brown, ala TRB. Thomas, from South Carolina, attended the University of Virginia before moving west to Napa Valley soon after graduating. He started his wine career working for Turley Wine Cellars in 1997. Today, he is winemaker for over a dozen wine brands including Schrader, Maybach, Revana, and Outpost, specializing in premium Cabernet. He has produced multiple perfect 100 point wines, notably "Old Sparky" by Schrader Cellars leading to being awarded Winemaker of the Year in 2010 by Food & Wine. He hooked with up Wallis starting with the 2009 vintage release. This label is sourced from fruit their 13 acres of vineyards in Diamond Mountain District at an elevation between 600 to 800 feet. They grow Bordeaux varietals Cabernet (75%), Cab Franc and Petit Verdot. 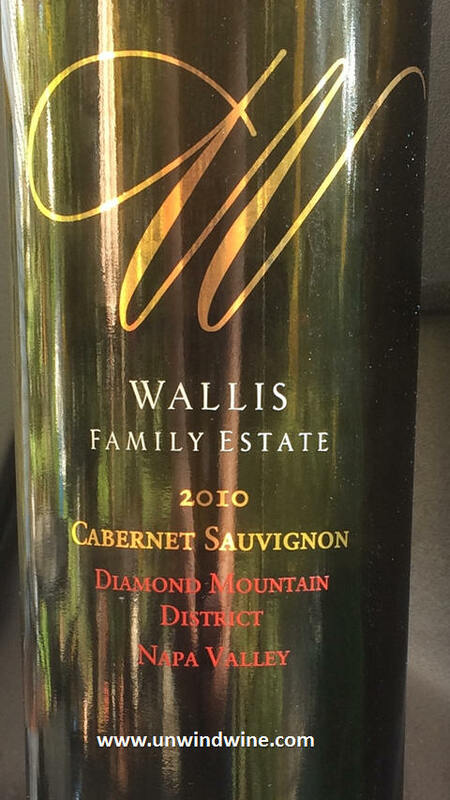 The vineyards are part of an 85 acre property on Diamond Mountain Road in Calistoga acquired by Wallis in 1975. The property came with an old stone Castle built in 1906 by Jacques Pacheteau, which they are turning into a classic stylish tasting room, and a Barn built in the late 1800’s designed by W.H. Corlett. Fruit from the vineyards planted in 1997 was initially sold to David Ramey of Ramey Wine Cellars from 2001-2003, and then to Chris Carpenter of Lokoya Winery from 2004-2005. From 2006, Wallis has produced wine for themselves under their own label. Wallis Family Estate currently produce their wines at Thomas' new winery venture at Mending Wall Winery on Silverado Trail in St. Helena. Dark blackish garnet colored, medium-full bodied, slightly lean moderate black cherry and berry fruits accented by a layer of tar, smoke and spice. Somewhat closed and tight on opening it opened after an hour and much moreso the next evening to aromatic floral and incense, ending in powerful, intense, acid laced tannins on the finish. We've shared this wine with TRR a couple times over the years. 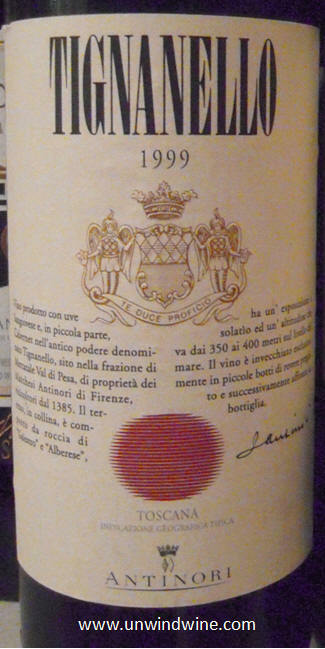 Classic SuperTuscan Blend hitting its stride in its fifteenth year, perhaps at the apex of its tasting window. Consistent with my notes from earlier tastings. Deep Ruby colored, medium-full bodied, forward bright vibrant mouthful of black cherry predominates with notes of currant, spice, and hints of tobacco and leather on a lingering silky tannin finish.